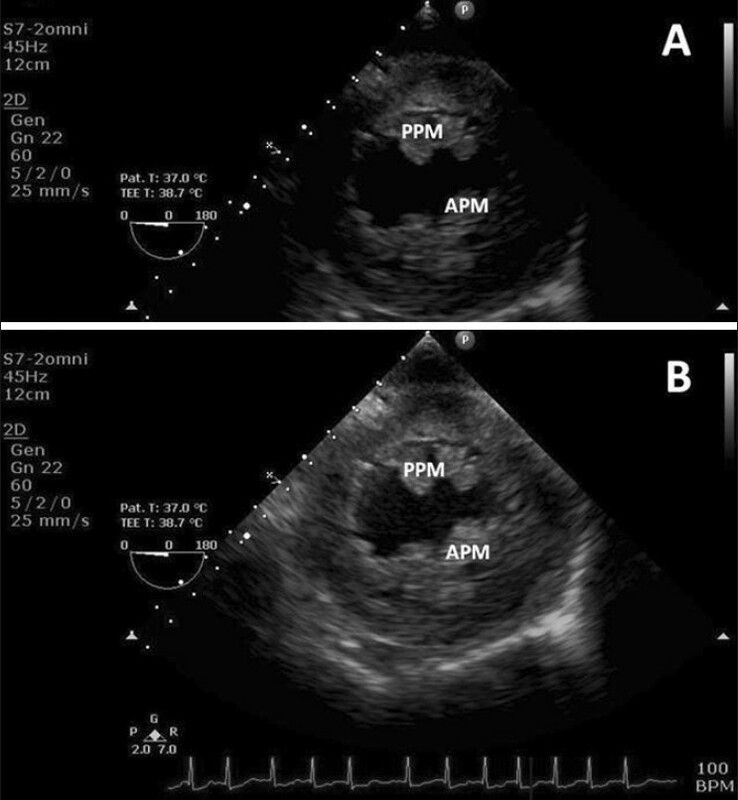 Transesophageal Echocardiography (TEE) has rapidly become a powerful monitoring technique and diagnostic tool for the perioperative management of cardiac surgical and hemodynamically unstable patients. It is a semi-invasive procedure that should be performed by a trained echocardiographer, who understands the indications and the potential complications of the procedure. TEE is used to visualize the anatomy of the heart and thoracic aorta, assess global and regional cardiac function and detect the presence of intracardiac air during cardiac surgery. Adequate knowledge of the physics of ultrasound and TEE machine controls is imperative to optimize the image quality, reduce artefacts, and prevent misinterpretation of the diagnosis. 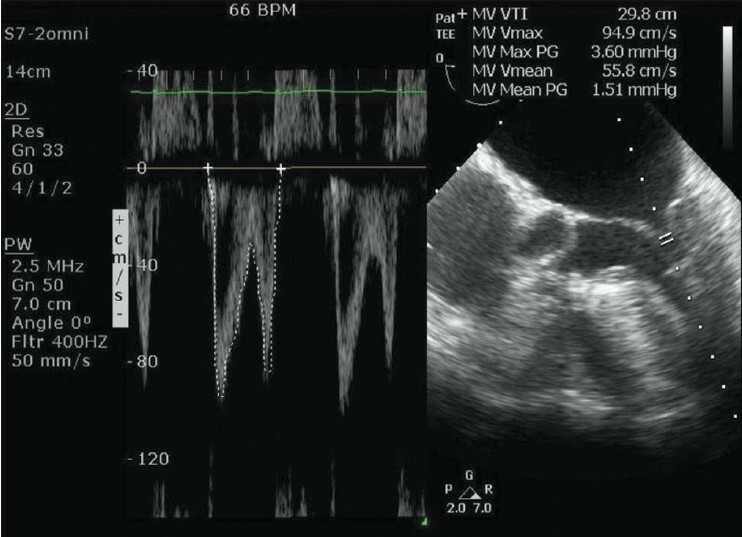 The aim of this article is to explain the underlying physical principles and focus on the instrumentation and use of controls in the practical use of transesophageal echocardiography. Echocardiography uses ultrasound (US) to create real-time images of the cardiovascular system in action. Two-dimensional (2D) and Motion (M) mode imaging are used for obtaining the anatomical information, while Doppler and Color Flow imaging are used for information on the blood flow. The cardiac ultrasound machine comprises of three components: The transducer, the display and recording unit, and the echocardiography unit. 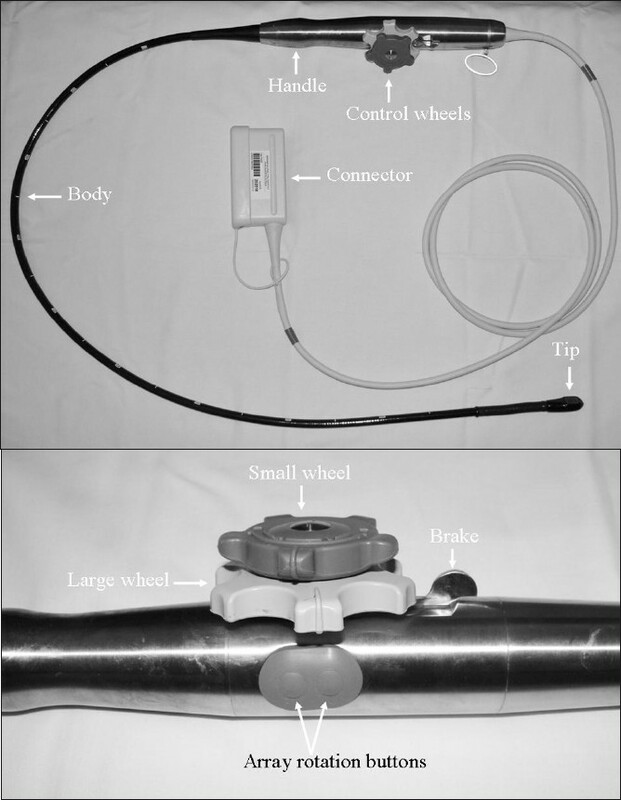 The multiplane TEE probe is essentially a modified gastroscope with a motor-controlled ultrasonic transducer at its tip [Figure 1]a. The standard connector is plugged and locked into the machine slot. The handle contains two control wheels and array rotation buttons [Figure 1]b. It is crucial that the tip of the probe should be aligned in the neutral position during movement, to prevent tissue damage. The body of the tube includes an articulating section, which can be controlled by the large and small control wheels. Each wheel has friction brakes that hold the tip position without locking it. The probe position and orientation can be changed by maneuvring the probe using the two control wheels. The large wheel flexes the tip of the probe anteriorly (anteflexion) and posteriorly (retroflexion). The small wheel allows for lateral flexion or side-to-side movement of the tip. 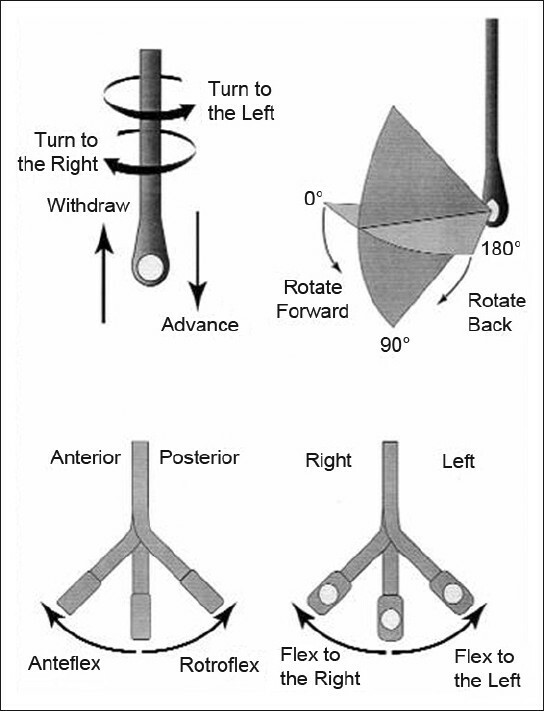 In addition, the probe can be advanced or withdrawn in a vertical fashion into the esophagus and stomach or manually turned to the left or right with respect to the esophagus  [Figure 3]. The array rotation buttons turn the mutiplane angle from 0 to 180°. The piezoelectric elements can be electronically rotated either clockwise or anticlockwise using the multiplane angle control, to enable viewing of the heart in any desired plane. The newer probes are enabled to suppress the electrocautery artifacts. Paediatric probes are of smaller diameter (5-7mm) and higher frequency (5-10MHz) with greater flexibility. Miniaturized multiplane micro probes are equipped with most of the features of adult TEE probes with a frequency of 4.2-7.4MHz. Conventionally, the transducer is located at the apex of the triangular field of display. In the mid-esophageal position, at 0°, the patient's right side is depicted on the left side of the display and vice versa [Figure 4]. Upon rotation of multiplane angle to 90°, the anterior and posterior structures are depicted on the right and left side of the display respectively. The field of view (FOV) is the plane or area scanned by the ultrasound transducer. The sector is a fan-shaped image with the narrow end displaying objects closer to the transducer and the wider section showing the more distant structures . The region of interest (ROI) should be kept as close as possible to the TEE probe. 2-D imaging is displayed on a gray scale, with the high amplitude signals being ascribed a white color and low amplitude a black color. The shades of gray form a picture of the heart in a sector. 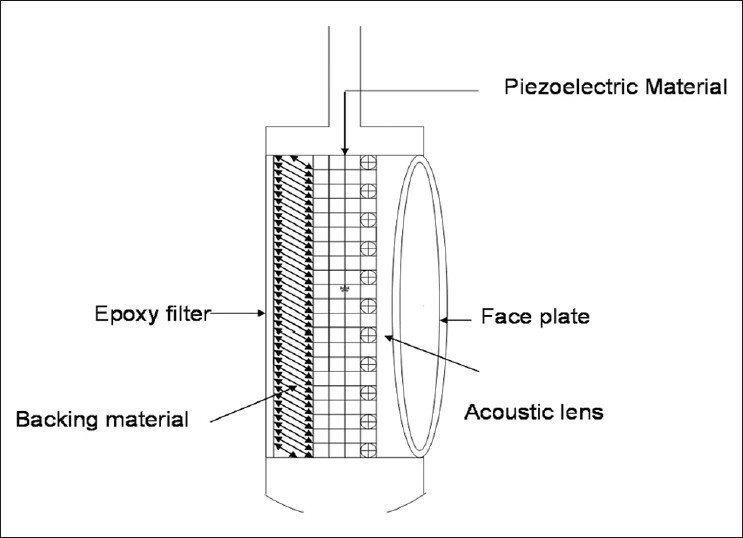 Each piezoelectric element of the transducer transmits a US pulse along a line. All echoes from the structures along this line are received, thus producing a scan line whose length is the image depth. The ultrasound beam then moves on to the next scan line position where the process is repeated [Figure 5]. Increased scan lines improve the resolution of the image. This control alters the vertical FOV of the image, and is used to get the ROI into view. Increasing the depth increases the time taken for the signal to return back to the transducer, thereby decreasing the frame rate, and vice versa. The freeze button freezes the real-time display and retains it in the digital memory, in a sequence of the immediately preceding frames. Scrolling the frames will allow selection of the appropriate image for study, annotation, and archiving. Freezing the image also stops the transmission of the ultrasound and prevents the probe from overheating and possible tissue damage. This control is a stationary pointing device that contains a movable ball rotated with the fingers or palm, similar to using a mouse on the PC. It is used for moving Doppler boxes to the desired location and for measuring and annotating. Quantitative assessment of the chamber dimensions, valve area, regurgitant orifice area, peak velocity, and area under the curve of the Doppler trace, provides useful, objective information for echocardiographic evaluation. The buttons for callipers and the trackball measure the distance between two points. This can be used for measuring chamber dimensions, diameter of the aorta, valve annulus, left ventricular outflow tract, and so on. This function is used to trace the object of interest and quantify the delineated area. Recorded echocardiographic images can be used for storing, manipulation, and comparison. The recording can be done on paper, tape, and optical or hard disks. The digital frame grabbing system obtains continuous, high quality, cine-loop recording. The images can be digitally transferred to a central server for storage via a network connection. The DICOM (Digital Imaging and Communications in Medicine) format is a standard for handling, storing, printing, and transmitting information in medical imaging. This enables comprehensive archiving, comparisons, including off-site access, and requisite security. Before starting the TEE examination, the preliminary checks include electrocardiography monitoring, entering patient verifiable data for easy identification and archiving, connecting and selecting the appropriate transducer probe, and finally choosing an appropriate TEE preset. Timing of the cardiac cycle from the ECG can be critical in making the proper interpretation of an echocardiogram, especially with spectral Doppler displays. The Power control has a direct impact on acoustic intensity and is used to select the minimal intensity levels required to produce an optimal image. The controls of imaging mode, pulse repetition frequency (PRF), focus depth and frequency have an indirect effect on acoustic intensity. 2D imaging mode disperses energy over the entire scanned area but Doppler concentrates energy in a particular area. Increasing the rate and time of the ultrasound signals increases the time-averaged intensity value. Receiver controls such as gain, dynamic range and image processing influence ultrasound without affecting the intensity output. Hence they should be optimized first before increasing the power. 2D imaging helps to image the heart motion in real-time enabling detailed morphological and functional assessment [Figure 6]. It also helps quantitative assessment of cardiac dimensions and provides the framework for M-mode and Doppler imaging. The various control buttons used to get an optimal image are described in [Table 1]. Most machines describe power in terms of decibels (dB). An increase of 3 dB increases power or intensity by twice the original and a decrease of 3 dB will halve the power- the 3 dB rule. Minimum power which is consistent with good image quality should be used. Gain is the degree of amplification of the returning US signal. The gain button alters the "brightness" of the whole image by adjusting the amplification of all returning echo signals. Minimal gain should be used to provide an optimal image with good quality without dropout or blooming of signals  [Figure 7]. As a rule of thumb, fluid and blood should appear black, myocardium a medium grey and the pericardium and calcification, a bright white color on the grey scale. LGC is similar to TGC except they alter image gain at specific angle sectors in a direction perpendicular to TGC. It is useful to image hypoechoic images caused by suboptimal positioning [Figure 9]. This control determines the spread of weaker echoes relative to stronger echoes within the grey scale range of the system. Dynamic range is the term used to describe the ratio of the largest to the smallest signals measured at the point of input to the display. 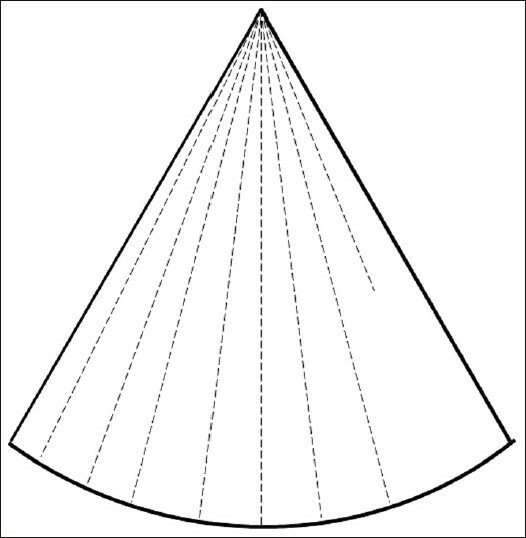 Compression alters the difference between the highest and lowest echo amplitudes by compressing the wide spectrum of amplitudes and fitting them in a grey-scale range. Increasing compression provides a smoother image with more shades of grey but may increase unwanted signals i.e. "noize"[Figure 10]. A mid-level compression is usually adequate for optimal imaging. Motion mode imaging is one of the basic forms of imaging. One scan line provides a single dimensional "ice-pick" view of the heart and the signal is plotted as brightness mode against time on the X-axis. The amplitude of movement of an object and its distance from the transducer is displayed on the Y-axis  [Figure 11]. The Doppler shift is defined as the change in frequency of sound reflected by a moving object and is determined by the Doppler equation  [Figure 12]. Doppler shift caused by red blood cells reflecting ultrasound can be used to assess the trajectory and speed of normal and abnormal blood flow by determining flow velocity, direction and turbulence. 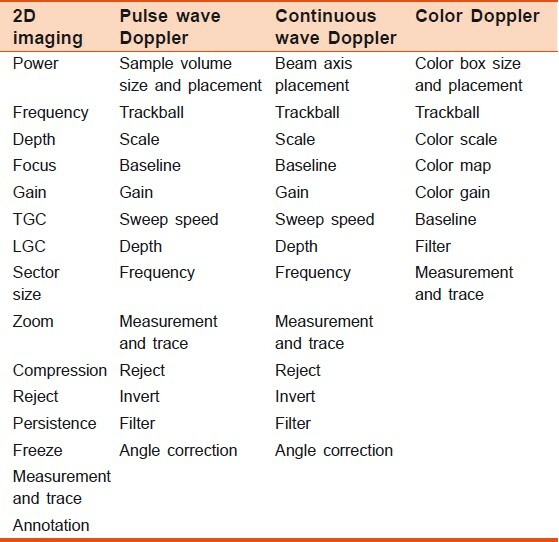 The two main types of Doppler imaging techniques are pulsed wave Doppler (PWD) and continuous wave doppler (CWD) [Table 1]. PWD uses a single piezoelectric crystal which acts both as a transmitter and receiver to measure blood velocity intermittently at a particular area called as sample volume. Adjusting the gate control can increase or decrease the size of the sample volume. The trackball is used to place the sample volume at the area of interest. The ROI should be as near the transducer as possible. This is because as imaging depth increases, there is a decrease in the pulse repetition frequency. Gain is used to amplify the returning Doppler signals. The audio volume can be used to hear the Doppler shift to optimize the spectral waveform. The velocity is displayed as a spectral waveform on the vertical axis with time displayed on the horizontal axis [Figure 13]. 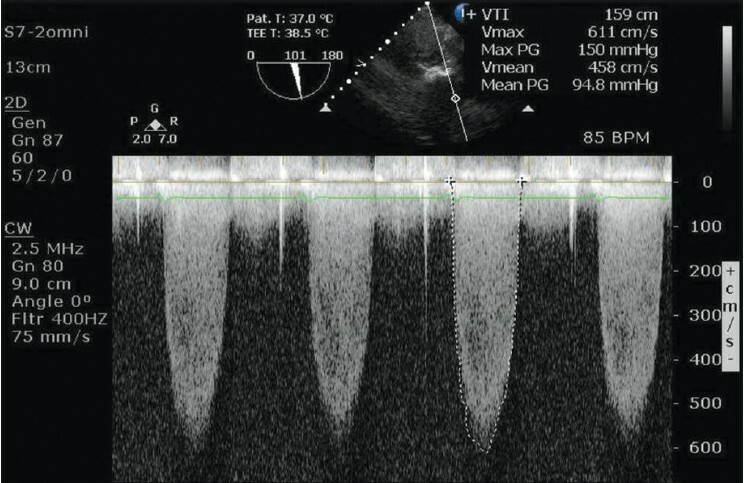 By convention, blood flowing towards the probe is displayed above the baseline and blood flowing away from the probe is displayed below the baseline. The baseline should be adjusted to accommodate the complete waveform. Since Doppler shift is proportional to ultrasound frequency, lower frequency transducers are more useful as there is less chance of reaching the Nyquist limit. Reject function is used to eliminate low-velocity signals near the baseline by filtering the lower frequencies and trace a sleek waveform. The invert button is used to reverse the direction of the signal display above or below the baseline irrespective of the direction of flow. The CWD uses two separate piezoelectric crystals to transmit and receive signals in order to measure all the different blood velocities along the beam axis, continuously. This makes it difficult to accurately know the depth of the reflected signal. The main disadvantage of CWD is its lack of depth discrimination (Range ambiguity). The CWD is displayed as a waveform with a filled-in spectrum caused by the different velocities being measured along the scan line [Figure 14]. A turbulent flow, caused by obstruction, results in spectral broadening and increased velocities. The scale control adjusts the range of velocity that can be displayed, and should be set so that the highest velocity spectral trace can be displayed without cutting off the peak of the trace. This control indicates how fast the spectral waveform can sweep across the screen. Increasing the sweep speed decreases the number of cycles and increases the width of the waveform. A low sweep speed shows more waveforms on the screen and is useful to demonstrate waveform variations caused by respiration and arrhythmias. All Doppler systems have a variable wall filter control that sets a threshold beyond which frequency signals can be removed from the display. This control changes the angle calculation in the Doppler equation by adjusting the beam axis to the direction of assumed flow, thereby minimizing the error. This does not actually change the direction of the Doppler beam nor does it alter the quality of the spectral recording. It is preferable to adjust the transducer to position the beam axis parallel to the blood flow rather than count on angle correction. Compression, and the Reject and Invert buttons can be used as for the pulse wave Doppler. The Color Flow Doppler (CFD) provides a striking display of both blood flow and the cardiac anatomy by superimposing the PWD flow data on 2D images  [Figure 15]. It is useful in diagnosing the abnormal flow as well as confirming the normal structures. The PWD used for color mapping, records the mean velocity data from multiple sample volumes - color packets along each scan line. This velocity data is then color-coded; blue indicates flow away from the transducer and red is the flow toward the transducer. The color bar on the screen provides a reference frame for interpreting the colors. The color flow maps are then integrated with 2-D imaging to provide a real-time display. Excessive 2-D gain before superimposing the CFD should be avoided, as it may obscure the flow. Optimal adjustment of the color gain setting is essential, as too much gain will result in noise and impair the image quality and interpretation. A low gain setting will attenuate sensitivity and make the image appear smaller than the flow jet. The adjustable velocity scale is calculated by the machine depending on the depth of the image. When the blood-flow velocity exceeds the velocity scale of the color legend, the machine will continue to represent the velocity of the blood flow, but in the opposite direction. This means that once the velocity of blood flow in one direction exceeds the brightest red, the color will instantaneously change to the brightest blue, then gradually darken. The velocity scale must be set to around 50 - 60 cm/second usually. Lower scales increase sensitivity, but promote aliasing. When the flow is turbulent, some of the velocities will be depicted as a multicolored mosaic signal. The baseline button helps to shift the zero baseline of the velocity scale. Smoothing determines the grade at which the color packets merge into the adjacent packets. A low smoothing setting will create a speckled flow pattern and a high setting will blend the color packets together. 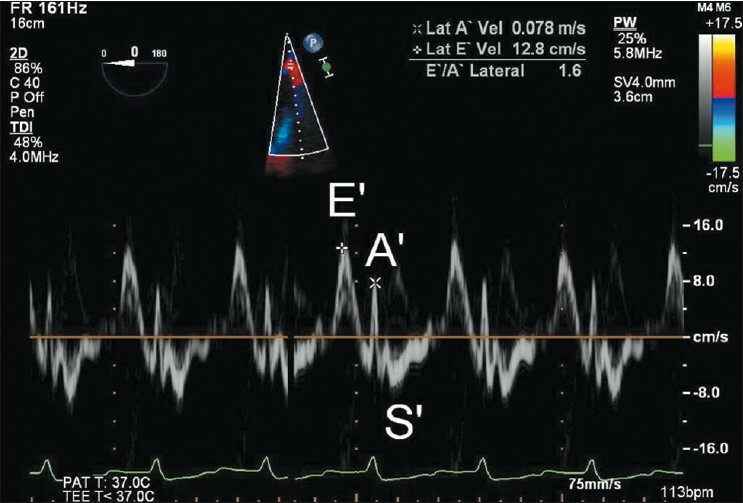 Tissue doppler echocardiography (TDE) uses the Doppler frequency shift to calculate low myocardial velocity, to objectively quantify regional myocardial motion  [Figure 16]. Pulsed TDE is similar to PWD, while the color-coded TDE display is based on assigning colors to different velocities. Lower velocity colors tend to be darker colors, while higher velocities are represented by brighter colors. This modality has been applied in the assessment of regional and global left ventricular systolic and diastolic function. TDE is limited by its reliance on the angle of interrogation. This problem can be solved by 2D Speckle Tracking Echocardiography which tracks tissue movement by offline analysis of acquired ECG triggered image loops. Speckles are small areas of different brightness and shape contained within the 2D gray-scale. By tracking the velocity, direction of movement and spatial relationship of speckle clusters during a cardiac cycle, strain and strain rate can be measured to quantify myocardial wall deformation. This provides a magnified RT 3D image, with sector dimensions of 90° × 90° and a lower frame rate of 10 - 15 Hz. Selecting a 3D zoom displays two orthogonal 2D images, which can be modified in the lateral and elevational planes, to accommodate the ROI within the box. The acquired dataset can then be cropped and orientated to provide excellent spatial resolution for structures such as mitral valves, intraoperatively [Figure 17]. Although this mode is not an RT imaging modality, it provides a large volume image, with sector dimensions of 75°×75°. Selecting 'Full volume' displays two orthogonal 2D images that can be modified in the lateral and elevational planes, to accommodate the ROI. Small sub-volumes are acquired over four to seven cardiac cycles, synchronized, and then 'stitched' together to display the 'blob view'. The frame rate varies between 20 and 50 Hz, depending on the number of cardiac cycles. The dataset can then be cropped and orientated. The 3D color flow Doppler can be superimposed on a 3D full volume, using seven cardiac cycles, but it reduces the frame rate to <10 Hz. Arrhythmias, electrocautery artifacts, and probe movements cause a demarcation line, termed as a stitch artifact, which is seen between the sub-volumes, distorting the anatomy. Offline analysis of digitally recorded cine loops using specialist software allows manipulation, rotation and cropping of an image to display details in a surgical orientation including measurements of distance, area and volume. Echocardiography is an important technology, widely used for the evaluation of cardiac anatomy and physiology. Despite the recent advances of 3D TEE, a sharp, optimized 2D image is pivotal for the reconstruction. The low degree of invasiveness and the capacity to visualize and assimilate dynamic information that can change the course of the surgery is an important advantage of TEE. An understanding of the fundamental principles of cardiac ultrasound and knowledge of ultrasound instrumentation and settings is necessary for the proper acquisition and interpretation of the echocardiographic data. License Agreement between the author and Elsevier provided by Copyright Clearance Center, Elsevier Limited. 1. Burwash IG, Chan KL. Transoesophageal Echocardiography. In: Otto CM, editor. The Practize of Clinical Echocardiography. 3 rd ed. Philadelphia: Elsevier Saunders; 2007. p. 3-25. 2. Savage RM, Aronson S, Shanewize JS, Mossad EB, Licina MG. Intraoperative echocardiography. In: Estafanous FG, Barash GP Reeves JG, editors. Cardiac Anaesthesia-Principles and clinical practize. 2 nd ed. Philadelphia: Lippincott Williams and Wilkins; 2001. p. 237-294. 3. Edler I, Hertz CH. The use of ultrasonic reflectoscope for the continuous recording of the movement of heart walls. Vol. 24. Lund: Proceedings of the Royal Physiographic Society; 1954. p. 40-58. 4. Kerut EK, Mcllwain EF, Plotnick GD. Basic principles of ultrasound Physics. In: Kerut EK, McllwainEF, Plotnick GD, editors. Handbook of Echo-Doppler interpretation. Oxford: Blackwell Publishing; 2004. p. 1-6. 5. Dowsett DJ, Kenny PA, Johnstone RE. Ultrasound Principles. In: Dowsett DJ, Kenny PA, Johnstone RE, editors. The Physics of Diagnostic Imaging. 1 st ed. London: Chapman and Hall Medical; 1998. p. 415-31. 6. Barnett SB, Ter Haar GR, Ziskin MC, Rott HD, Duck FA, Maeda K. International recommendations and guidelines for the safe use of diagnostic ultrasound in medicine. Ultrasound Med Biol 2000;26:355-66. 7. Podgoreanu MV, Prokop EK. Physics of Two-Dimensional and Doppler Imaging. In: Mathew JP, Ayoub C, editors. 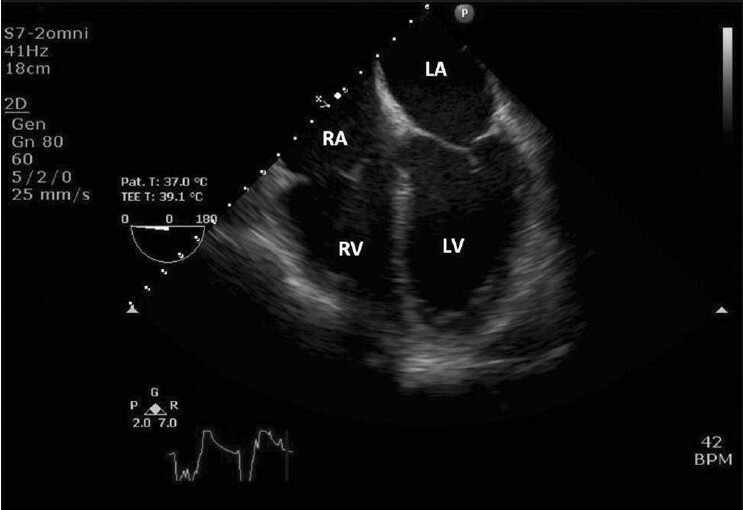 Clinical manual and review of transesophageal echocardiography. USA: Mcgraw-Hill Companies Inc; 2005. p.1-15. 8. Holland CK, Deng CX, Apfel RE, Alderman JL, Fernandez LA, Taylor KJ. Direct evidence of cavitation in vivo from diagnostic ultrasound. Ultrasound Med Biol 1996;22:917-25. 10. Maslow A, Perrino AC. 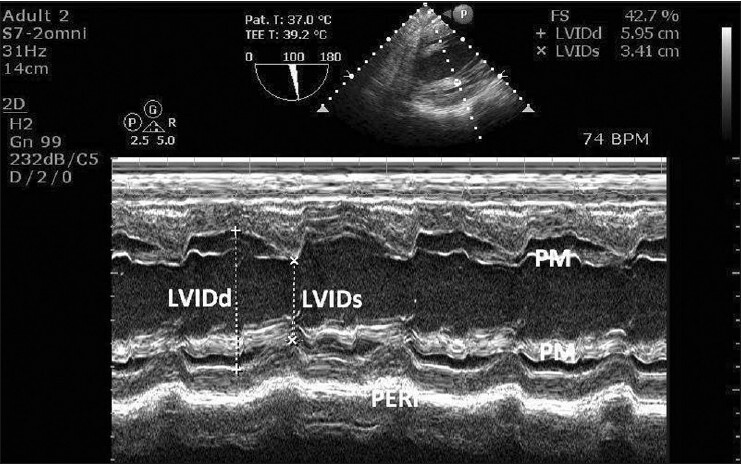 Principles and technology of Two-Dimensional Echocardiography. In: Perrino AC, Reeves ST, editors. 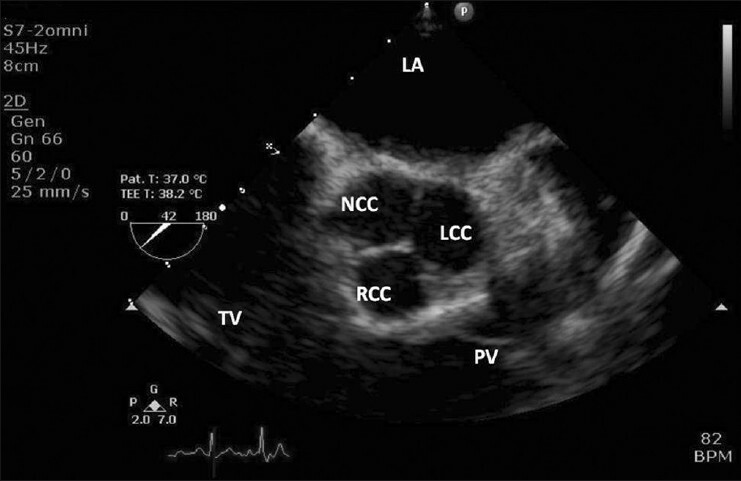 A Practical Approach to Transesophageal Echocardiography. 2 nd ed. Philadelphia: Lippincott Williams and Wilkins; 2003. p. 3-23. 11. Shanewize JS, Cheung AT, Aronson S, Stewart WJ, Weiss RL, Mark JB, et al. ASE/SCA Guidelines for Performing a Comprehensive Intraoperative Multiplane Transesophageal Echocardiography Examination: Recommendations of the American Society of Echocardiography Council for Intraoperative Echocardiography and the Society of Cardiovascular Anesthesiologists Task Force for Certification in Perioperative. Transesophageal Echocardiography. J Am Soc Echocardiogr 1999;12:884-900. 12. Dowsett DJ, Kenny PA, Johnstone RE. Ultrasound Imaging. In: Dowsett DJ, Kenny PA, Johnstone RE, editors. The Physics of Diagnostic Imaging. 1 st ed. London: Chapman and Hall Medical; 1998. p. 436-65. 13. Griffith JM, Henry WL. A sector scanner for real time two-dimensional echocardiography. Circulation 1974;49:1147-52. 14. Anderson B. The Two Dimensional Echocardiographic Examination Chapter. In: Anderson B, editor. The normal examination and echocardiographic measurements.1 st ed. Queensland: MGA Graphics; 2000. p. 11-44. 15. Bashein G, Dtemer PR. Physical principles, ultrasonic image formation and artifacts. In: Sidebotham D, Merry A, Legget M, editors. Practical Perioperative Transoesophageal Echocardiography. 2 nd ed. Philadelphia: Elsevier Saunders; 2011. p. 2-21. 16. Oh JK, Seward JB, Tajik AJ. How to obtain a good Echocardiographic Examination. In: Oh JK, Seward JB, Tajik AJ, editors. Ultrasound physics, techniques and medical knowledge, The Echo Manual. 3 rd ed. Philadelphia: Lippincott Williams and Wilkins; 2006. p. 1-6. 17. Walsh CA, Wilde P. Introduction to Echocardigraphic Modalities. In: Walsh CA, Wilde P, editors. Practical Echocardiography. London: Greenwich Medical Media Limited; 1999. p. 21-36. 18. Thomas JD, Adams DB, Devries S, Ehler D, Greenberg N, Garcia M, et al. Guidelines and recommendations for digital echocardiography. J Am Soc Echocardiogr 2005;18:287-97. 19. Lawrence JP. Physics and Instrumentation of Ultrasound. Crit Care Med 2007;35 (8 Suppl): S314-22. 20. Feigenbaums H, Armstrong WF, Ryan T. Physics and Instrumentation. In: Feigenbaums H, Armstrong WF,Ryan T, ed. Text book of Echocardiography. 6 th ed. Philadelphia: Lippincot Williams and Wilkins; 2005. p. 11-45. 21. Kahn RA, Salgo IS. Principles of Ultrasound. In: Konstadt SN, Shernan SK, Oka, editors. Clinical Transoesophageal Echocardiography. 2 nd ed. Philadelphia: Lippincott Williams and Wilkins; 2003. p. 3-9. 22. Lee D, Solomon SD. Essential Echocardiography. In: Solomon SD, editor. A practical Handbook. New Jersey: Humana Press; 2007. p. 9-33. 23. Forsberg E, Adams D. Understanding of Ultrasound System Controls. In: Mathew JP, Ayoub C, editors. 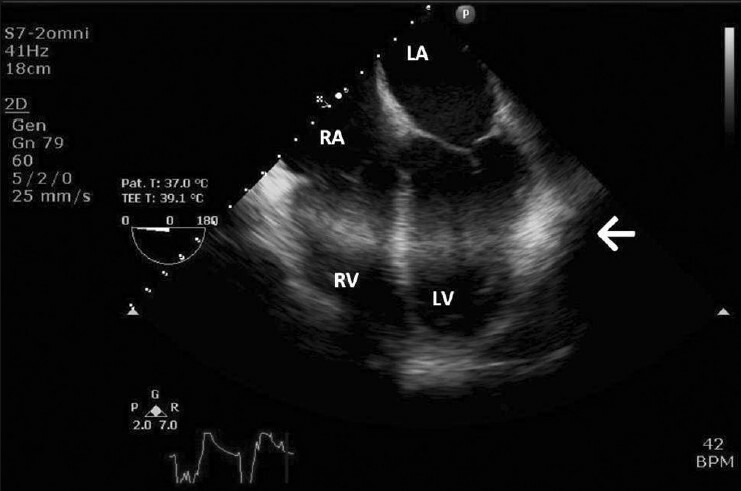 Clinical manual and review of transesophageal echocardiography. USA: Mcgraw-Hill Companies Inc; 2005. p. 16-30. 24. Dyal HW, Frith MD, Reeves ST. Techniques and Tricks for Optimizing Transesophageal Images. In: Perrino AC, Reeves ST, editors. 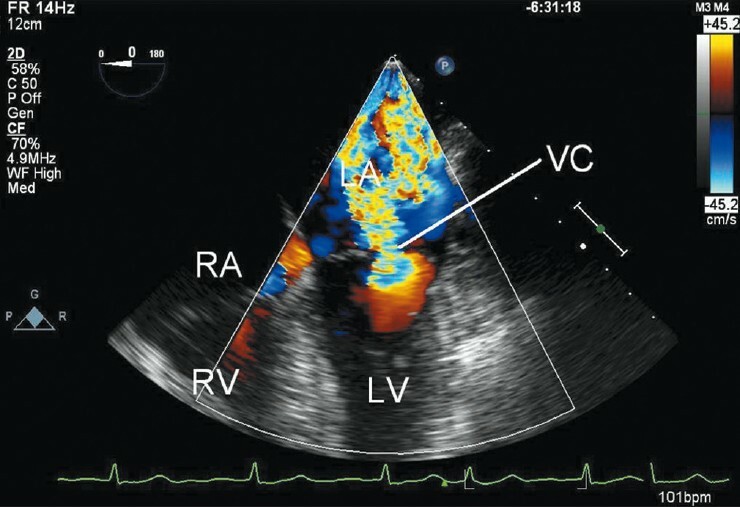 A Practical Approach to Transesophageal Echocardiography. 2 nd ed. Philadelphia: Lippincott Williams and Wilkins; 2003. p. 435-45. 25. Weyman AE. Physical Principles of Ultrasound. In: Weyman AE, editor. Cross-sectional echocardiography. Philadelphia: Lea and Febiger; 1982. p. 3-61. 26. Wiegers SE, Scott CH. Physics and Instrumentation of Ultrasound. In: Silvestre FE, Wiegers SE, editors. Intracardiac Echocardiography. Oxon: Taylor and Francis; 2006. p. 7-17. 27. Chambers J. Echocardiographic Techniques. In: Chambers J, editor. Echocardiography in clinical practice. London: The Parthenon Publishing Group; 2002. p. 9-20. 28. Thomas JD, Licina MG, Savage RM, Aronson S. Physics of Echocardiography. In: Savage RM, Aronson S, editors. Comphrensive Textbook of Intraoperative Transoesophageal Echocardiography. 1 st ed. Philadelphia: Lippincott Williams and Wilkins; 2005. p. 3-23. 29. Callaway M, Wilde P. Instrumentation. In: Izzat MB, Sanderson JE, Sutton, editors. Echocardiography in adult cardiac surgery. Oxford: MG, ISIS Medical Media; 1999. p. 3-13. 30. Sutherland GR, Stewart MJ, Groundstroem KW, Moran CM, Fleming A, Guell-Peris FJ, et al. Color Doppler myocardial imaging: a new technique for the assessment of myocardial function. J Am Soc Echocardiogr 1994;7:441-58. 31. Sugeng L, Shernan SK, Salgo IS, Weinert L, Shook D, Raman J, et al. 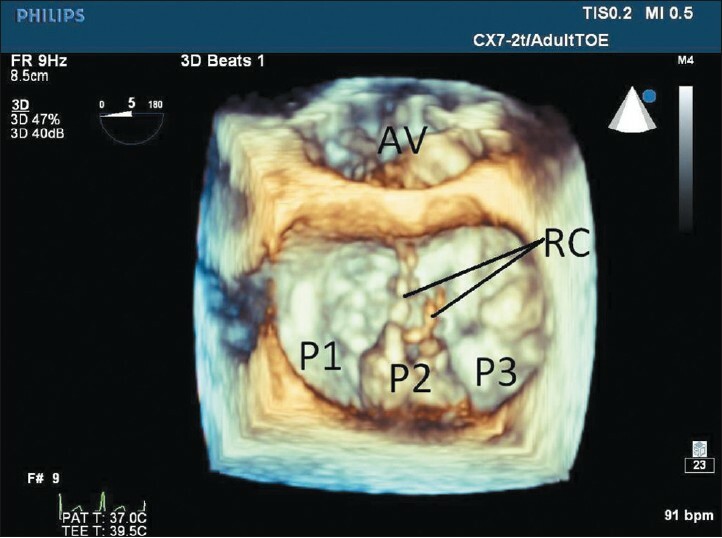 Live 3-dimensional transesophageal echocardiography initial experience using the fully-sampled matrix array probe. J Am Coll Cardiol 2008;52:446-9. 32. Hung J, Lang R, Flachskampf F, Shernan SK, McCulloch ML, Adams DB, et al. 3D echocardiography: A review of the current status and future directions. J Am Soc Echocardiogr 2007;20:213-33. 33. Perk G, Lang RM, Garcia-Fernandez MA, Lodato J, Sugeng L, Lopez J, et al. 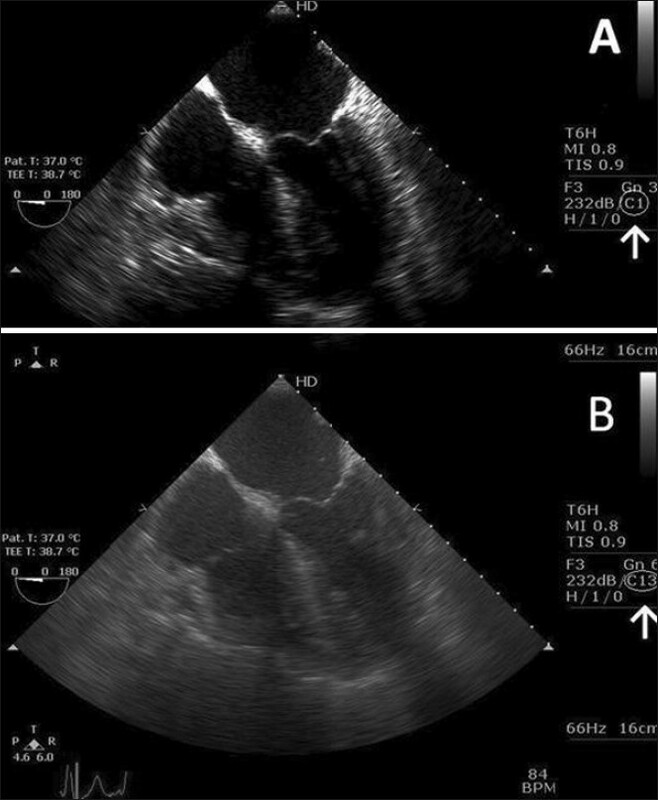 Use of real time three-dimensional transesophageal echocardiography in intracardiac catheter based interventions. J Am Soc Echocardiogr 2009;22:865-82. 34. 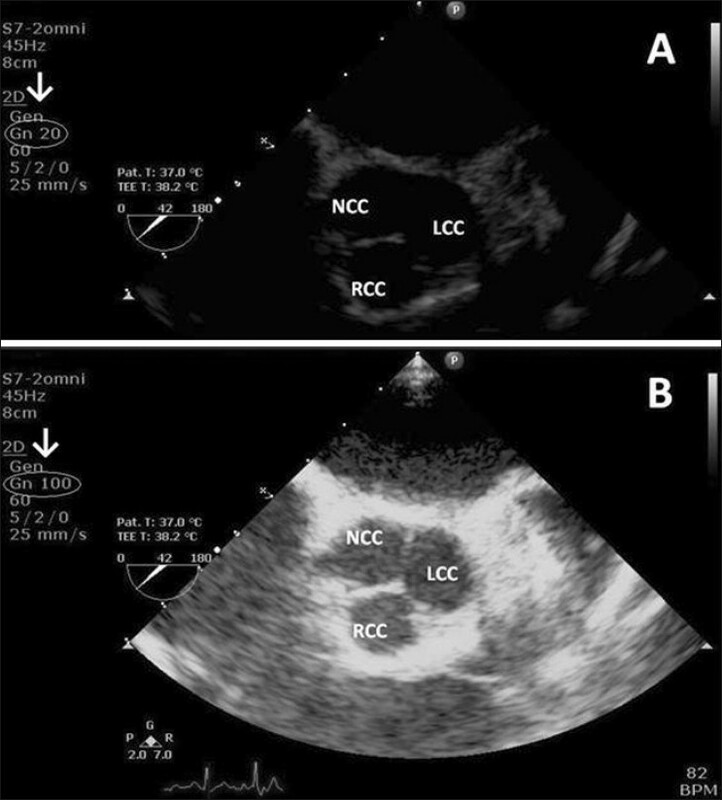 Vegas A, Meineri M. Core review: three-dimensional transesophageal echocardiography is a major advance for intraoperative clinical management of patients undergoing cardiac surgery: a core review. Anesth Analg 2010;110:1548-73.